Once in a while, a product shows up and changes the landscape of an industry overnight. That could be an overly dramatic thing to say about an e-cigarette when this industry has existed for less than ten years, but when the Volcano Lavatube e-cigarette came out at the tail end of 2011, there wasn’t a single high-quality variable-voltage electronic cigarette on the market that could be purchased in a full kit for under $100. All you really had were the ProVari — which is extremely high-quality but costs over $210 for a full kit — and a bunch of other e-cigarettes that were questionable both in terms of quality and safety. Volcano decided to work directly with a manufacturer in China called L-Rider to develop a safe high-performance e-cigarette that could be mass-produced inexpensively, and the Lavatube was born. Note: The original Volcano Lavatube is no longer available. Look at my review of the Lavatube 2, or look at my list of the best e-cigarettes of 2016 to see some more up-to-date devices. So, what’s the big deal about the Lavatube, and why would anyone want to buy such a huge e-cigarette? The Lavatube is a product for people who want something that can boost vapor production, flavor and throat hit higher than what you would get with a regular e-cigarette. 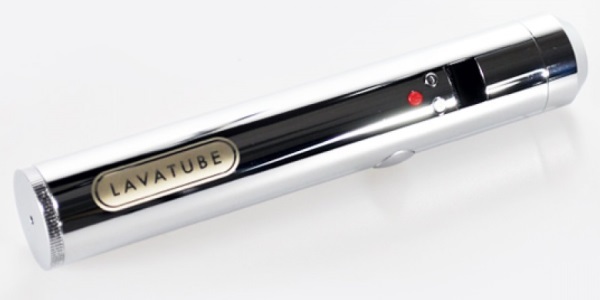 In fact, “boost” is the key word here because that’s what the Lavatube has inside its casing: a boost circuit. The boost circuit takes power from the Lavatube’s big 1600 mAh battery and adjusts it to the voltage you set using the buttons on the front of the e-cigarette. 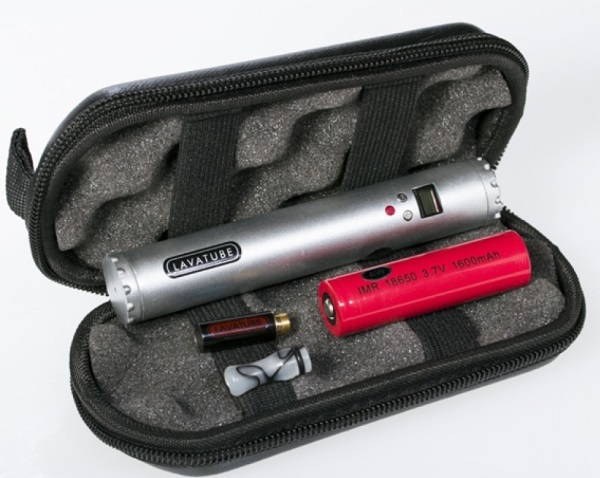 You can set the Lavatube anywhere between 3.0 and 6.0 volts. In comparison, a regular e-cigarette starts out at 3.7 volts and drops to around 3.2 volts as the battery drains. In terms of the watts delivered, you’re talking about 12 watts of maximum vapor production with the Lavatube, while a regular e-cigarette gives you a bit under 7 watts. For me, getting that kind of vapor production for the first time was a pretty incredible experience because I was tasting so many new flavors in my e-liquids that were previously too mild to detect. Although Volcano markets the Lavatube as a product for experienced e-smokers — and I’m generally inclined to agree, for reasons I’ll discuss shortly — the Lavatube kit does include everything you need if you don’t own an e-cigarette yet. In addition to the Lavatube e-cigarette itself, you’ll receive your first battery, a battery charger, an atomizer, a drip tip and a carrying case. You’ll just want to make sure to add a bottle of e-liquid to your order. Although the Lavatube isn’t a difficult e-cigarette to use, it definitely is a different beast than your regular “twist on a cartridge and go” e-cigarette. So, I think a bit of background information is warranted so you understand what you’ll be getting. First of all, understand that you really don’t have to worry about doing anything wrong thanks to the Lavatube’s safety features. 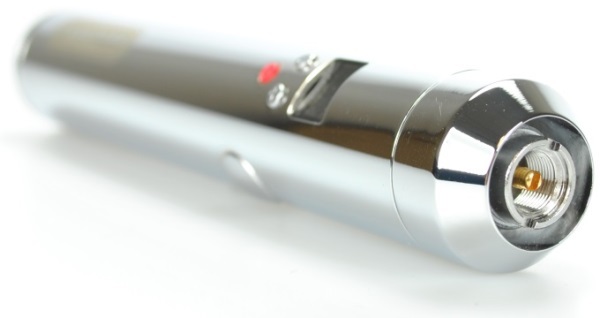 If you insert the battery incorrectly, for example, the Lavatube won’t be damaged — it just won’t work. If you set the Lavatube to a voltage your atomizer or cartomizer can’t support, it’ll drop the voltage for you. A variable-voltage e-cigarette really doesn’t get any safer, so there’s no need to worry that the Lavatube will be too complicated for you to handle. Start by connecting your battery for the charger and plugging the charger into an outlet. You’ll need to wait a few agonizing hours before you can use the Lavatube to make sure that your battery will deliver a consistent charge over the long term. When the battery is ready, unscrew the bottom cap of the Lavatube, drop in the battery with the positive end facing the top of the Lavatube and screw the bottom cap back in. I’m going to assume that you’re using the Lavatube with the included atomizer and drip tip, but if dripping isn’t your thing, never fear; the Lavatube has 510 threading so it’ll work with most cartomizers, too. So, twist the atomizer into the terminal at the top of the Lavatube and push the drip tip into the top of the atomizer. Open your bottle of e-liquid and drip a bit of the liquid into the drip tip’s opening. Push the plus or minus button on the front of the Lavatube until the screen reads “4.0,” hold the fire button down and take a puff. Next, it’s time to make adjustments. If the vapor tastes dry or harsh, add a little more liquid, wait a few seconds and puff again. If the atomizer gurgles, you’ve added too much liquid and need to either keep vaping until it stops or twist the atomizer off and clean it. If the vapor is perfect and you just want more of it, it’s time to try increasing the voltage. Dial it up about a half volt at a time until you’re happy. You’ll find that every type of atomizer and cartomizer has its own sweet spot. Should I Buy the Lavatube E-Cigarette? As I mentioned above, the Lavatube may not be the e-cigarette to buy if you’re a complete beginner. If all of this sounds a bit too complicated for you or you simply think you’d prefer something smaller, check out my article about the best e-cigarette for beginners instead. If you decide later that you’d like a bit more vapor, the Lavatube will be a great upgrade for you. If you’re a very heavy smoker, though, you might want to think about the Lavatube because there’s a possibility that a smaller e-cigarette won’t deliver enough nicotine to keep you satisfied. If your nicotine needs are unusually high, I think the bit of extra effort is worth no longer being dependent on tobacco. If you’re already aware of the Lavatube and came to this review by searching online, though, you already know that you want more vapor than your current e-cigarette is delivering. You only want to find out whether the Lavatube is going to deliver the vapor production you want — and I’m here to tell you that it will. It doesn’t have quite the oomph or the classy styling of the ProVari, but it’s hard to argue with the Lavatube when it’s available at less than half the price.